i Click 'view all' to instantly compare this good deal with offers on other top digital thermometers. Koogeek Forehead & Ear Thermometer Bluetooth Non-Contact is currently selling at $25.79, approximately $0.08 lower than average, giving a potential saving of $0.17 right now. With a lowest price of $25.79 and an average of $25.87 it is selling on the low end of its usual range. Price volatility is 0.3% (meaning it does not change often), so the price should stay low for a while. Right now this product is a recommended 'good deal'. The current deal is also the best price on this item over the last month. 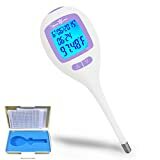 Compare the current price, savings (in dollars & percent) and Buy Ratings for the top Digital Thermometers that are closely related to Koogeek Forehead & Ear Thermometer Bluetooth Non-Contact. Here is how Koogeek Forehead & Ear Thermometer Bluetooth Non-Contact compares with other leading Digital Thermometers. Free Koogeek App monitoring via Bluetooth Koogeek Smart Thermometer helps you monitor your family's health history via free Koogeek app. It adopts advanced high precision infrared technology, which enables you to get scientific and accurate measurement results in 1 second with one click. Two measurement modes enable you to get your forehead and ear temperature easily. Smart & Rapid Measurement Advanced infrared sensor technology provides more secure and accurate temperature measurement. The body temperature can be measured in 1 second with one click, faster than other standard thermometers. Dual Modes Switch between two modes: ear temperature mode and forehead temperature mode. Note: The thermometer will produce an alarm sound if measurement temperature is lower than 93.2°F / 34°C or higher than 107.9°F / 42.2°C.When measuring the forehead temperature, there may be a little inaccuracy, due to the influence of measurement environment. 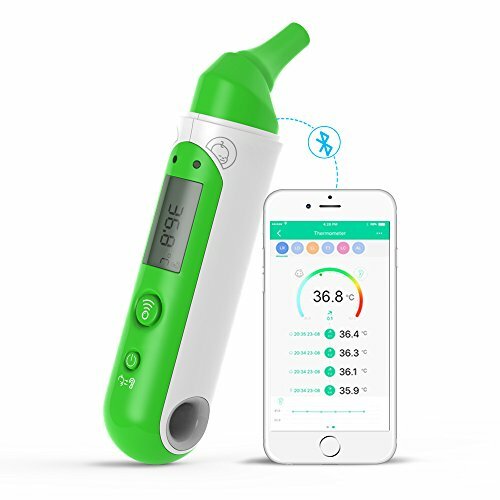 How to use the Smart Thermometer:- Please download the Koogeek app in the Apple App Store.- Please set up the device and connect it to your iphone.How to switch ? and ? :- When powering off, please long press the power button until it alternately displays the ? and ?, and just choose the one you need.How to switch ear and forehead mode:- When powering on, please just press the power button to switch the mode you want.Seller Warranty from Koogeek:- 30 Days Money Back Guarantee- 18 Months Replacement Warranty- Lifetime Product Support Guarantee- 100% Customer SatisfactionPackage includes:1 * Koogeek Smart Thermometer1 * Instruction Manual1 * CR2032 Coin Cell Battery Features[Track Your Temperature via Free App] Free Koogeek app lets you track your or your child's body temperature in real time through the smartphone via Bluetooth 4.0 and monitor your health trends whenever and wherever. (Available on iOS and Android)[Safe & Sanitary ] No contact with the skin, making it the most sanitary way to take temperature.The thermometer will produce a alarm sound if measurement temperature is lower than 93.2°F / 34°C or higher than 107.9°F / 42.2°C. [Memory Function] Store the latest 30 sets of measurement data and the previous measurement data can be transferred to the Koogeek app through Bluetooth. The body temperature can be saved and checked easily. [Instant Reading ] Advanced infrared sensor technology provides more secure and accurate temperature measurement. The body temperature can be measured in 1 second with one click, faster than other standard thermometers.